From Seattle: Drive North on I-5 to the US/Canadian border. Continue North towards Vancouver, BC. Turn West on Hwy. 17 to Tsawwassen Ferry Terminal, (Watch for the signs). Take the Ferry to Duke Point (Nanaimo). If you like, you can also drive through Vancouver to North Vancouver at Horseshoe Bay, and take the ferry from there to Nanaimo. From Nanaimo, drive North on Hwy. 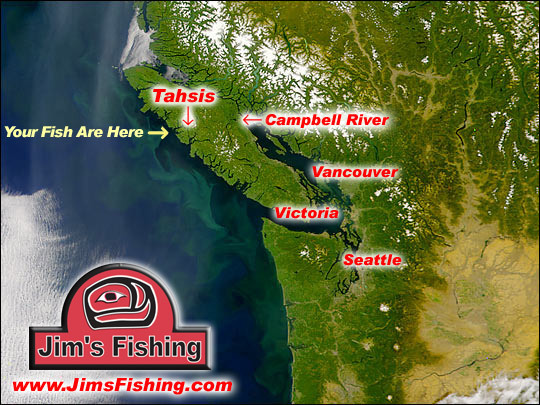 19 (the Island Highway) to Campbell River. Campbell River is a great place to do any last minute shopping and have a meal. If you can't live without something, this is the place to get it. From Campbell River, take Hwy. 28 West (on the North end of town before you cross the Campbell River). Follow the signs to Gold River. Don't forget to check your fuel - next available gas station is in Gold River, and closes at 10 PM. Head Bay Station is now CLOSED in Tahsis. Ocean View Cafe now has fuel. Also a full line of groceries and beer, wine and liquor, in addition to full service cafe for eating in or taking out. From Gold River, take the road to Tahsis, cross the bridge over the Gold River, turn left at the "T" intersection, cross another bridge, and then turn right, up the hill toward Tahsis. The road turns to gravel at the top of the hill. Normal driving time takes about an hour and a half (I've done it in an hour-in a '79 Pinto!). The Tahsis Road. Now then, if you have heard anything about Tahsis, you have probably heard stories about "the road". Let me reassure you, it is a good gravel road. There is no reason to be afraid of it. There are two graders that work the road daily and keep it in good shape. Many of the stories you may have heard come from some years back, before the road was widened, (back in the '70's it was only wide enough for one car). If you have ever driven gravel roads before, this one is one of the better ones. The only things I would caution you on is to watch your speed, and keep to the right when rounding corners. There are many spots where you can build up more speed than is wise. Some corners come up a little too fast, and the hills are a good place to gear down and keep your speed to a minimum, especially if you are towing a trailer or have a heavy load. If you are coming in at night, be sure that both your headlights are working and properly aimed, there are no streetlights on this road until you get to Tahsis. Enjoy your trip, and keep a camera handy. On your drive in there is a good chance at seeing some of the local wildlife. There are Black Bears, Elk, Columbia Blacktail Deer, Swans, Geese, Ducks, and Grouse in the area, and I have seen them all at one time or another during drives over the Tahsis road.